Each day January 9-21, a winner will be selected by Rafflecopter. Yes, a winner every day for 13 days! The 13 winners will each win $50.00 worth of product from a Friends of ESGI store, and a FREE 1 year license to ESGI! The 13th winner will win an iPad Krayon Kiosk, 4 iPads, 4 chairs along with ESGI for a full year! 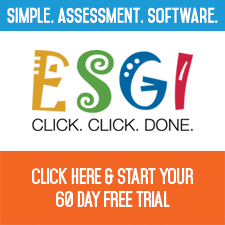 If you are not a current user of ESGI, click on the ESGI logo above and register for a 60 Day Free trial. Be sure to use the code: B7227 to save $40.00! Remember, no credit card is needed. The full-version trial is absolutely free. If you are a current user, or you have your brand-new user name that you have just created, go to the Rafflecopter below, enter your USERNAME, and Viola! You are entered a chance for some amazing prizes. Earn extra points by visiting the ESGI Friends' Blogs as listed below. Leave a comment on their ESGI Giveaway post, and then you can check off the "I Commented" in the Rafflecopter. Each blog that you comment on will earn you extra entry points. And yes, you can comment and score those extra 13 points every day!